Tunisia's new assembly chose a veteran rights activist Monday as the country's first democratically elected president. 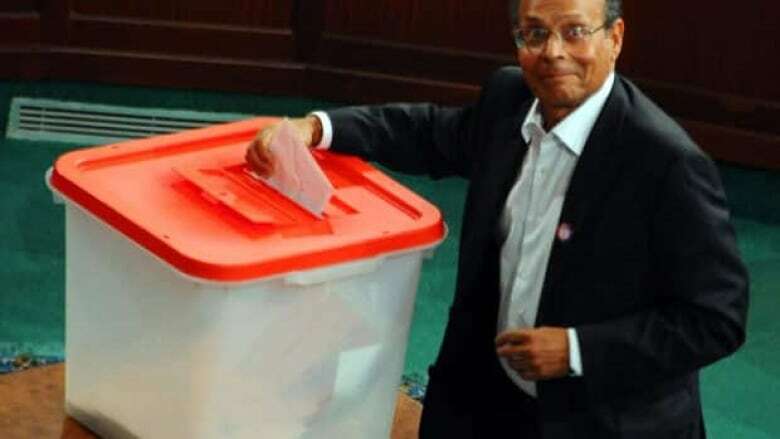 Moncef Marzouki of the Congress for the Republic Party on Monday became interim president with 153 out of 217 votes in the assembly, with three voting against, two abstentions and 44 blank ballots cast as a protest vote by some members. "It is the greatest honour that anyone could dream of being elected by two thirds of the vote," he said after the election that was followed by a rendition of the national anthem. "I will exert all my efforts to be worthy of this trust." Marzouki for years struggled against Tunisia's dictator President Zine El Abidine Ben Ali and was imprisoned in 1994 for attempting to run against him as president. The election of the interim president follows the weekend approval of temporary bylaws to guide the nation until the assembly finishes a constitution. It also comes six weeks after landmark elections and nearly a year after Tunisians overthrew their longtime dictator Zine El Abidine Ben Ali — an uprising that sparked similar movements in other Arab states. The new bylaws give most of the power to the prime minister, as opposed to the president under the old system — a change that worries the opposition. The bylaws also stipulate that the president must be Muslim with Tunisian parents, over 35 and not a dual citizen of another country. Tunisia is 98 per cent Muslim, but has some Jewish and Christian citizens. Marzouki is expected to appoint a prime minister from the moderate Islamist Ennahda Party, whose ruling coalition also includes the left of centre Ettakatol Party. The new prime minister then has 21 days to form a government. The prime minister and the government he forms also are in effect temporary until the country holds a round of post-constitutional elections. Although the bylaws passed with the coalition's comfortable majority, many were harshly contested by the opposition, which consists mainly of liberal and left-wing parties. "It is a shame this celebration of democracy has been marred by the lack of balance between the powers of the president and the prime minister, as well as the undetermined length of the assembly's mandate," said Chokri Yaiche of the Afek Tounes, or Tunisian Horizons Party. Nejib Chebbi of the left of centre Progressive Democratic Party warned of "a new dictatorship." "In the old regime, all the powers were held by the former president, today we are putting them in the hands of the prime minister," he said. Ennahda, which was severely repressed by the old regime, has said its goal is to ensure that there can never be another dictatorship in Tunisia. The party also has gone out of its way to reassure secular Tunisians that it has no plans on imposing religious values on one of the more Westernized countries in the Middle East. In any case, the issue that may be the most important in the minds of most Tunisians is the country's faltering economy. Last week the central bank warned that urgent measures needed to be taken as it revised down estimates for Tunisia's growth in 2011 from 1.5 per cent to flat or negative. Tunisia's economy relies heavily on tourism, which has been driven away by post-revolutionary unrest; the phosphates industry, which has been ravaged by labour strike; and exports to Europe, which is undergoing an economic crisis of its own. Once the government is formed, the assembly will turn its attention to writing the country's new constitution and preparing for presidential, legislative and local elections. Marzouki, who succeeds interim President Fouad Mebazzaa, will be Tunisia's fourth president since its independence from France in 1956.